You know what infuriates me? - having someone look me in the eye and tell me to relax. Makes me mad instantly! When riding a motorcycle however, that is what has to happen before anything else. You need to be able to relax your upper body, and recognize when tension returns. The biggest issue I see in most riders is what I refer to as stiff-arming the bike, locking the elbows and gripping the bars tightly. You have instantly created a new spring in the suspension system, one that goes all the way to the contact patch of the front tire against the pavement. Think about that. 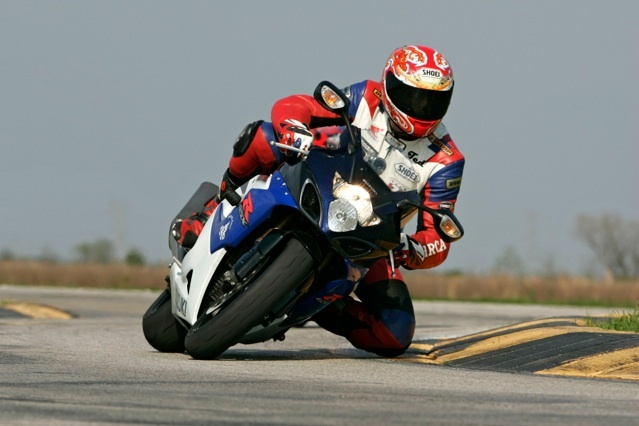 Here the front tire is rolling along, attempting to create 100% traction by reacting to the road surface and you are forcing it to go in the direction your locked arms are creating. You are literally absorbing a percentage of the available traction. Who are you doing this for? Let the tire read the road, let it hunt gently for the surface as it rolls across it, let the bars move in your hands slightly. Learn to relax your arms by flapping your elbows, to be comfortable with the bars moving around in your hands. All of these actions will lead to your increased sensitivity to the front end of the motorcycle, giving you gentle signals of available traction as the bike crosses the road. Now this is not meant to say “Take your hands off of the bars”, it is meant to say, “Don’t strangle the grips”. Let them dance around a little in your hands, let the front end do its work without fighting you. Locking your arms forces the tire to go where you are aiming it, absorbing valuable traction that may make the difference in getting through a tough spot. The bike really wants to succeed in its role of successfully completing a turn or stopping action. It was designed to do this and assuming that your contradictory, self-taught habits are more effective can lead to predictable consequences. Relaxing your upper body, relaxing your arms, watching for signs of tension such as sore hands, stiff arms, an aching neck as well as keeping your mind going at all times will open up a new horizon of bike control which will keep you grinning all day inside of that helmet.